So you're in need of new brakes on your E46? 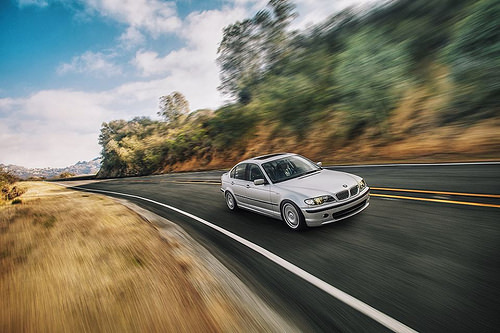 This guide will go over some of the basics of the brakes on your BMW E46 3-Series and will provide a guide to quality replacements at all budget levels. First off, the brakes on your BMW are large. Your BMW 325i/325ci/325cic/325xi come with 300x22mm front and 294x19mm rear rotors. If you drive a 330i/330ci/330cic/330xi, the brakes are even larger at 325x25mm front and 320x22mm rear rotors. That's 11.8" and 12.8" diameter, respectively for each model's front rotors. This translates into strong, reliable, and consistent stopping power under most conditions. The large size of the rotors means the brakes are able to operate under severe conditions with low risk of overheating quickly. The efficacy of the factory BMW brakes on your E46 is not only the size of your rotors, but the pad material and suspension tuning. That's right, the quality of the factory BMW brakes are dependent on a specific recipe which the engineers at BMW have spent years and millions and millions of dollars developing. Virtually every automotive journalist the world over has praised the BMW E46 3-Series for its world-class brakes. Not to say there isn't room for improvement. Every manufacturer has to consider development costs, tooling, market research, supplier contracts, noise and wear characteristics, profit, etc. I think it's safe to say, however, BMW has struck the perfect balance at balancing all these considerations. For 99.99% of your driving, the stock BMW brakes are optimum, in my opinion. Sure you can get some race pads and gain marginal increases in pedal feel, consistency namely after high-speed repetitive stops, but for a daily driven car, consider that these upgraded "race" brake pads may not provide the consistency and quality of braking stock pads deliver, particularly in "cold" temperatures you will normally see on the street. The last thing you want is to T-bone a car that pulled out in front of you on the way to work because your "race" pads needed 10 repetitive stops on the track in order to become immediately effective. Race pads also tear into rotors and make a ton of noise. There's usually a price to pay when you gain performance. Remember to exercise extreme caution and safety when working on and servicing your brakes. Consult a professional for assistance if you are not able to perform brake service yourself or if it is your first time. Use proper safety equipment such as eye protection, quality jack stands and jacks if necessary. If you decide to lift your car to perform any work, always place your wheels underneath sturdy portions of the vehicle such as the frame as a fail safe. Always work on your car on a stable sturdy dry flat level surface free of any debris. Always let someone know you are working on your car and have them be with you if possible. These postings as well as any postings on this blog is for information and education purposes. Happy motoring! Here are some examples of BMW brake kits. Do your own research and what brands you want. These are for information/example purposes. I personally recommend BMW or OEM as stated above. Or high quality aftermarket. Thank you for using my Amazon links on my site. I receive a few pennies per each dollar and it doesn't affect you at all. It helps me run this blog and pay for hosting/domain fees. I clicked on the rotors under the 328 section to just peek at what you suggested. FCPEuro says they will not fit my 328Ci. It did however say the 325 sets would fit. I only checked front rotors for fitment. Revisions to the post have been made! Great article and information. Love reading your blog.